The first thing you need to do, if you haven’t already, is try to make sure the board and air are completely free of dust, debris, fingerprints, and any other potential contaminants. This is easier said then done if you are glassing in the same room as you built the board. Fine wood dust will stay in the air for a very long time. If you have an air cleaner you can remove a lot of this dust by letting the cleaner circulate the air through the filter. If you do not have this luxury, I recommend that you wait 24hrs from when you sanded the board and cleaned the room before you start glassing. Imperfections caused by dust are not a big deal, just realize you will not have a glass smooth finish without a bit of wet sanding. Wiping down the board with a clean rag and denatured alcohol will do a good job of prepping the board prior to your first coat or after any coats that you sand. Your goal is to do your glassing in a warm room with a consistent temperature free from bugs. If this is not possible raise the temperature of the room and let it cool as you glass. You should turn off forced air heating and close doors that will circulate dust. Decent lighting is also nice as you really want to be able to see any bristles, dry spots or areas of uneven coverage while you apply the resin. The board should be well supported with full access to the rails. If you are glassing at home on saw horses or something similar you can improvise something to raise the board up enough to allow you to comfortably wrap the rails. 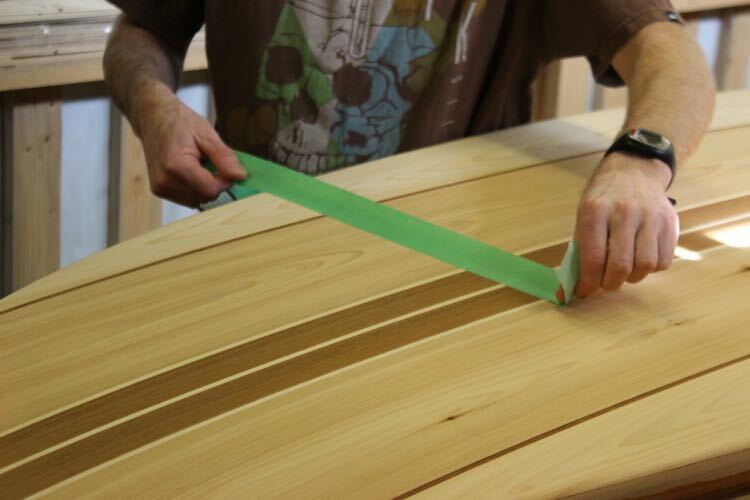 The board pictured is being glassed on a shaping stand. The supporting arms have been protected from drips with a garbage bag and the board has been raised with 4 rolls of packing tape. The painter’s tape has been wrapped with 1 wrap sticky side up preventing the board from moving as it is glassed. The board has been whipped down with a clean lint free rag (t-shirt) with denatured alcohol. 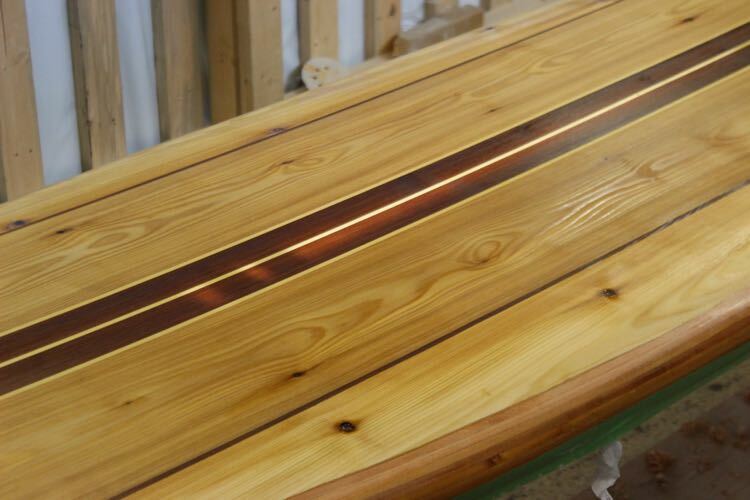 Any imperfections in your sanding that show when wetted with denatured alcohol will most likely show when the board is glassed. If you find that you have some touch ups to sand try to move the board to another area if possible or fix them without creating a ton of dust. 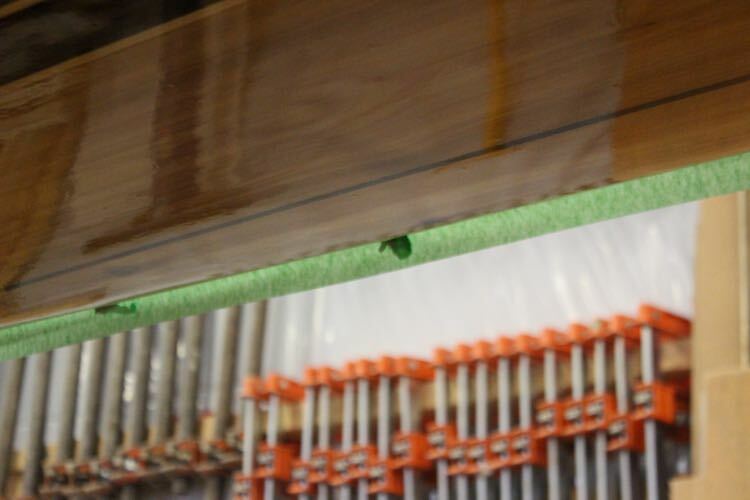 Once the board is cleaned off, you need to tape off the rails with painters tape, preferably 1 ½ inches wide, leaving the bottom edge of the tape hanging vertically to guide any excess resin toward the floor. 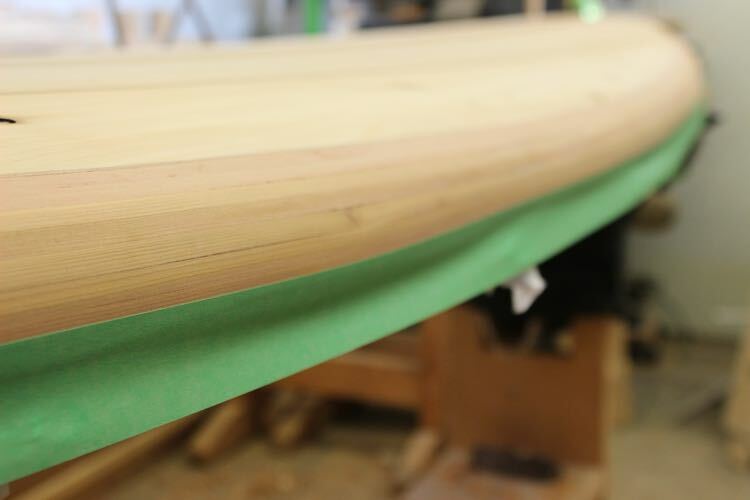 The top edge of the tape should be well stuck to the mid-point of the rail around the nose and middle of the rail. Depending on the boards shape you might want to have the tapeline gradually move to the bottom of the rail near the tail of the board. This is more important with surfboard inspired shapes like the TEN6 where you want the water to create a crisp release at the tail. With the top edge stuck work your fingers under the tape and free up the bottom two-thirds of the tape creating the drip-edge. 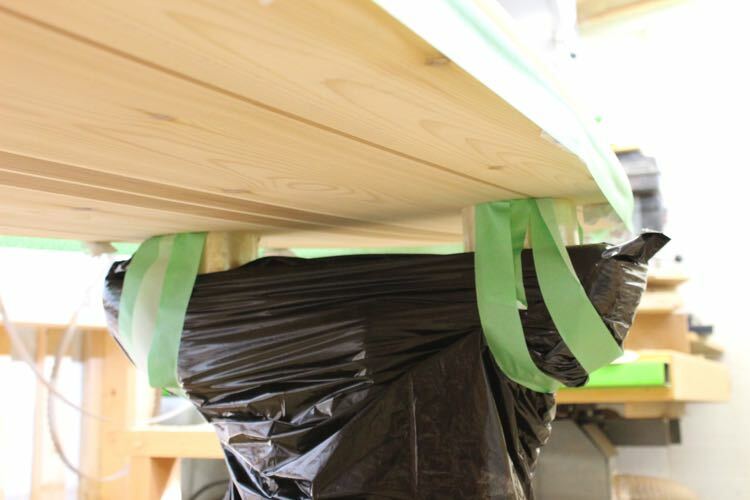 Prevent the drip-edge from collapsing by balling up tape or paper and sticking under the tape. You want to create a drip-edge (pictured) and not have the drips follow the rail to the underside, as they are a pain to remove. 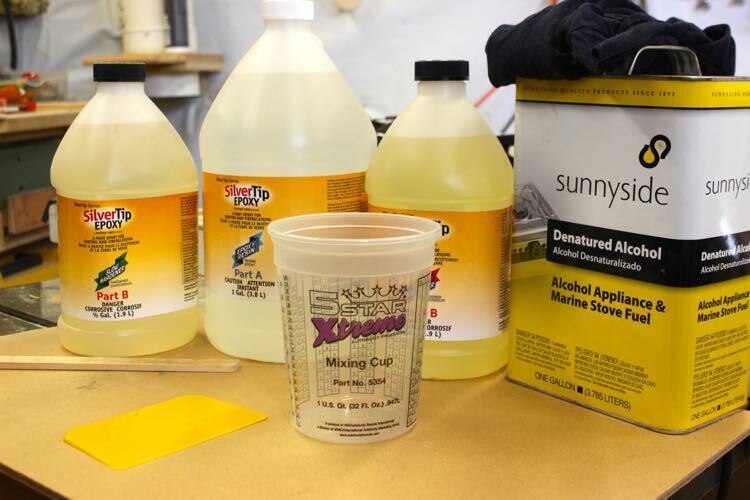 The basic supplies for the lamination coat are Part “A” and “B” epoxy resin, denatured alcohol, a mixing cup and stick, and a 6″ plastic squeegee, clean rag. The extra bottle pictured is fast hardener. You can mix & match the epoxy hardener to your liking (medium) as long as the 2:1 ratio of Part “A” to Part “B” is maintained. Part “B” epoxy is much easier to use if it is warm. 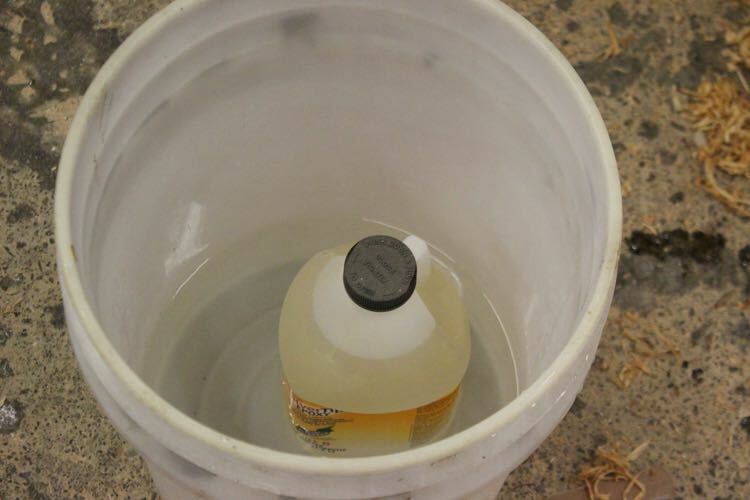 This epoxy is sitting in a hot water bath to make it more viscous. Unheated it behaves like honey. This is slow hardener that is being heated for 10 minutes making it is much easier to use. You never have to heat the part “A” side as it flows like water. Remember that raising the temperature shortens the working time so be careful if you are using fast hardener. The final step before glassing is what I call the tape trick. Dragging a piece of painters tape over the board minutes before glassing removes any lint, dust, bugs, that landed on the board while you were getting the room ready. You can see by looking at the sticky side of the tape if the board is ready!